Go ahead. 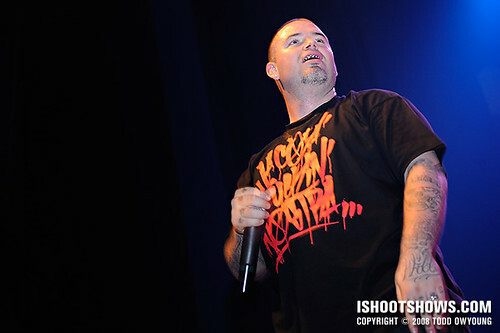 Ask Paul Wall to show you his grill. 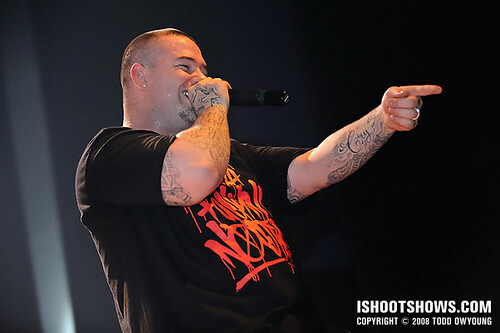 Co-headlining on the Fire & Ice tour with Kansas City rap king Tech N9ne, Paul Wall held up his end of the bill spitting his Texas flow with gleaming smile. This was an interesting shoot, to say the least. 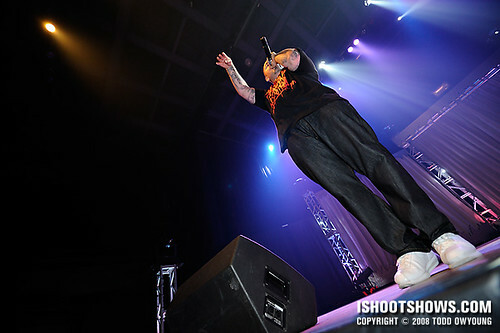 I shot without restrictions for nearly all of Paul Wall's set, using flash with abandon when the mood struck me. But for all the looseness, this set was incredibly challenging due to a combination of very low light and constant movement on stage. Image-forming light supplied by the house setup came almost exclusively from the back of the house, with blue hues dominating. Lighting from the front was a weak mix of warm white. Enter the flash. While I almost never use flash, simply because it's not allowed, this gig would have been an entirely different game without the convenience. I shot a mix of slow sync and standard flash, trying to achieve balance between the flash, warm frontlighting, and atmospheric mix from the back of the stage. Unlike the last time I employed flash, I used the speedlight on-camera and without a diffuser. Due to the fast-paced nature of the set, the simplicity of an on-camera solution was preferred in this instance. The exposure for this set was all over the place, from ISO 800 to 6400, 1/4 to 1/250, and everywhere in between. The only real constant was the aperture, which stayed in a more narrow range of f/2.8 to f/4 for this set. I shot a little bit with everything for this set, using the Nikon D3, Nikon 14-24mm f/2.8, Nikon 24-70mm f/2.8, and Nikon 70-200mm f/2.8 throughout the performance. Overall, I found myself a the wider focal lengths most often, though I forced myself to use the telephoto zoom to catch tighter shots of the grillmaster himself. One may be surprised how just difficult it is to photograph Wall's mouth full of ice while he's performing on stage. Though, no doubt, it be gleaming. 3rd photo down is killer! Awesome angle! Thanks, Bryan. 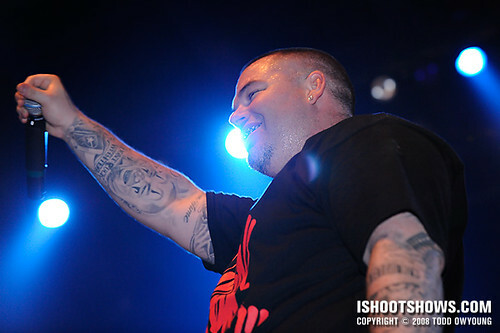 Paul Wall was reaching out to the audience so I ducked down in the pit and snapped that shot. There was no time to swap lenses, but I’d love to see what that image would look like made at 14mm. Dude, 2 after the jump, like Bryan mentioned above, is STELLAR! I absolutely love it.. the angle, fan’s hand, everything. I additionally really like 4. 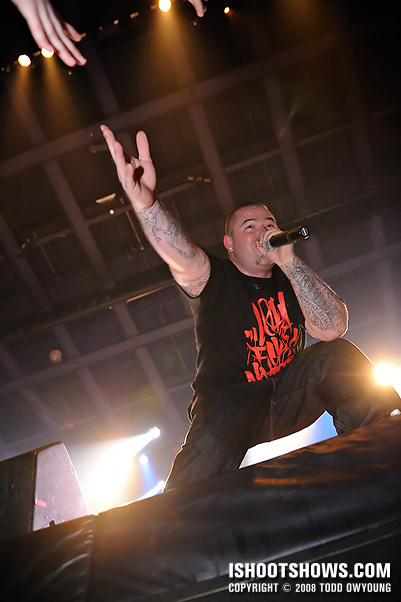 A photographer once told me: “There’s a rule in concert photography: You have to push the button whenever a performer sticks his finger in the air.” Well, he stuck his hand, but it’s amazing. Hey Chris, thanks for the comment, glad to hear you dig the wide shot of Wall giving love to the crowd. Just one of those moments when you react and hope everything goes for the best. Regarding the use of flash “with abandon,” I applied it liberally and without too much concern for any ill effects. I’d suggest eventually saving up for the SB-800 from Nikon, as it will give you more options for multiple-flash setups in the future should you need them. When you use your speedlight off-camera, do you typically hand-hold or mount it on a pole? CTO gel? I’ve experimented with this setup with mixed results, photographically and otherwise. My next idea is to just tape the flash to my hand so I don’t drop it. When I use flash off-camera, I’ll often either hold the speedlight in my left hand while holding the camera in my right. The downside of this is that when using a zoom, quickly changing the focal length means that the flash is going to be out of commission for a moment. 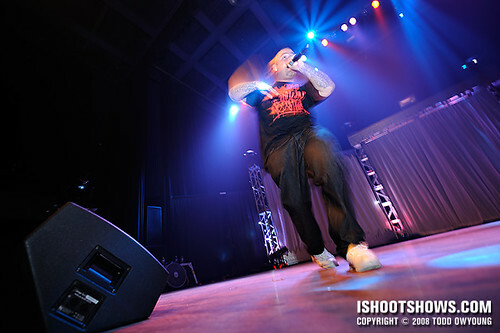 Other times, I’ll simply set the flash on the stage, which frees up both my hands to toggle controls on the camera/lens. But in both off-camera instances, I try to get the flash as far off-axis from the lens as possible. God, that set is AMAZING (referring to SPW at Pageant) — and look at you with your picture with Justin! Haha, that’s so cool. Why did you have to have a sync cable? I thought that one of the things with nikon was that flash could be wireless, or is that only for multiple flash units when you have one mounted? Regardless, I will start saving up for the SB-800 — just gotta learn how to make use of it without harsh shadows! Using Nikon’s CLS requires a way to trigger the remote flashes, either with commander flash or IR system, of which the D3 has neither. But, that would be a nice way to go about it given the option. Also, a sync cord simplifies issues with line of sight, which could be an issue with the hectic pace of shooting a band. The sync cord always fires the flash! Hey Ally, thanks for the kind comment. Glad you enjoyed the notes!